1. My first observation would be to look at how various reliable translations render the text. The KJV has “too superstitious.” The ESV, NASB, NKJ, NIV and NET have “very religious.” The CSB and NRSV have “extremely religious.” Always be wary when one suggests a meaning for a biblical term that cannot be found in commonly used, accurate translations. 3. Paul wants to appeal to the hearts of the Athenians with the Gospel. How can he best approach them? F.F. Bruce says, “He begins by mentioning that what he has seen in their city has impressed him with the extraordinarily religious nature of the Athenians. . .” (The Book of the Acts, p. 355). In his work, The Greek New Testament, Henry Alford observes, “He wishes to commend their reverential spirit, while he shews its misdirection” (vol. 2, p. 196). In his Greek-English Lexicon, Thayer states that Paul uses the term with “kindly ambiguity” (p.127). These above statements seem to best fit the context. Paul states a fact—they were religious—without expressing approval or agreement with the object of their religion. But that served as an opener to go on to show basic truths about the nature of God and His will for man, His creation. Acropolis at top. Stoa to your left. 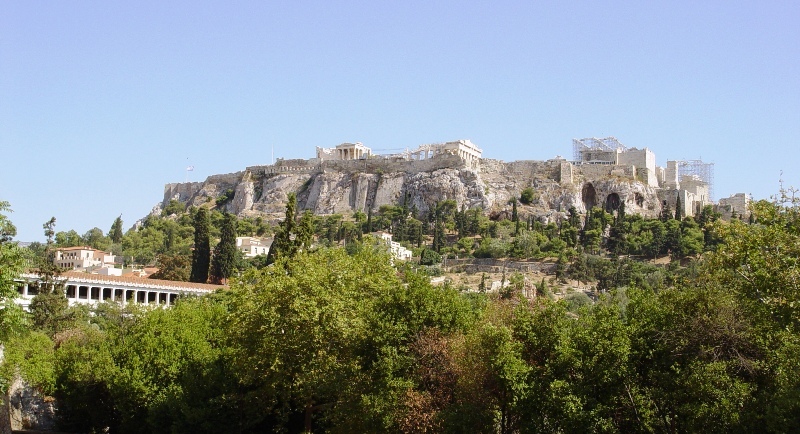 Paul's preaching in Athens is recorded in Acts 17. View from north. Photo by Leon Mauldin. First, in fairness, there is the literal meaning of the compound word, as seen in W.E. Vine’s work. Deisidaimon is composed of deido, “to fear,” and daimon, “a demon.” On the surface it would seem that it should be translated “one who fears/worships demons.” But that is not how word meanings are established. Try that with the word “butterfly.” When you define “butter” and “fly” have you shown what “butterfly” means? Vine goes on to give the best meaning of the word in Acts 17:22, as “more than others respectful of what is divine.” He says, “It also agrees with the meaning found in Greek writers; the context too suggests that the adjective is used in a good sense” (Expository Dictionary of New Testament Words. IV, p. 94). Meaning is established by usage. Gareth Reese says, “It must be noted in passing that deisidaimon could be rendered “worshipper of many demons,’ an expression exactly suited to a pagan people like the Athenians who lived in fear of evil spirits and who went out of their way to keep from offending the spirits” (Acts, p. 627; thusly rendered in Amplified and Darby). But one important rule of interpretation is to consider how the same word is used within Scripture. Our word is found in Acts 25:19 (noun form), where Festus explained to King Agrippa that the Jewish leaders, “. . . had some questions against him [Paul] about their own religion [deisidaimon] and about a certain Jesus, who had died, whom Paul affirmed to be alive.” Here Reese says, “There are reasons to believe Festus used it [deisidaimon] in a good sense here. It was the regular word by which a Roman would designate his own worship, and not being familiar with any technical Jewish word for worship, would naturally use the same word for their religion as he did for his own. Further, Agrippa professes a certain deference for the Jewish religion. Festus would not speak of the religion of his royal guest [Agrippa] in a derogatory sense” (Acts, p. 866). In conclusion, my judgment is that deisidaimon is best rendered “religion” and deisidaimonesterous as “very religious.” “It was well suited to a general and supremely neutral expression for religion or piety because diamon is used generally for a supernatural power. In the NT it is used in this sense by Festus in Acts 25:19 and the adj. is used by Paul of the Athenians in Ac. 17:22” (Kittel, Vol. 2, p. 20). You are currently browsing the archives for the Word Studies category.